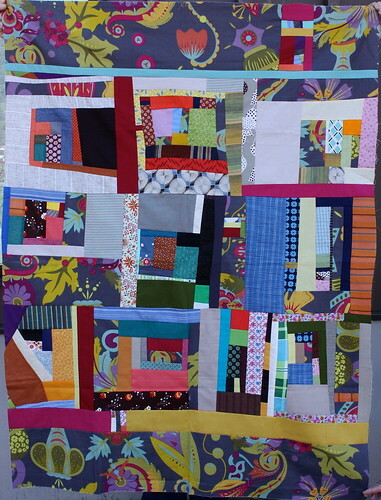 I’m excited to share the finished quilt back for the quilt top started in Denyse Schmidt’s Improvisational Patchwork class at Quiltcon. In the original blog post about the quilt top, you may remember, I selected all the solids to coordinate specifically with the Lucky Penny collection. All those great colors were in my bag at Quiltcon. Our instructions were to only use the fabric pulled out of the scrap bags. 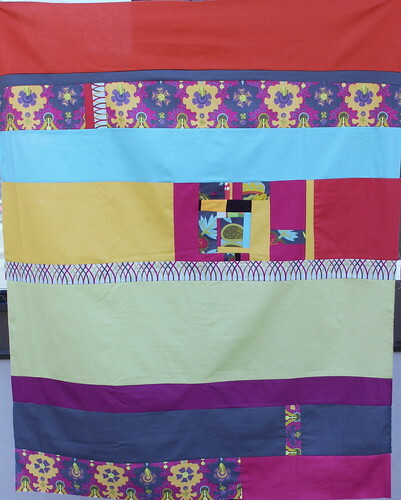 For the back, I used my coordinated solids to create an improv block using various sized scraps put together in much the same way as the front. This block became my jump off point for the whole back. I often hear from friends that piece their quilt backs that they had more fun creating the back of their quilt. Some will say they like the back better that the front. Why is that? Could it be that we allow ourselves the freedom to create with out a preconceived plan or idea of what the back should be? I would love to hear your thoughts. Do you like to piece the back or use one fabric for the back? The quilt back turned out so well. Depends on the quilt but more often than not I piece the back and like to think of the quilt as being reversible. Love your quilt back. I much prefer a pieced back. I do both! My most recent quilt I pieced the backing with the left overs. I think I actually like the back better than the front! LOL! The backs are for me to play!! They are satisfying because there are no rules and because I use up fabric that are odds and ends. I usually have more fun with the back of my quilts, too. Think you nailed it though; no expectations and freedom to create whatever. My daughter who is not a quilter said the same think about the backs of my quilts. I usually do piece my backs, because I’m just not that impressed with the selection of wide width fabrics out there, but as a hand quilter, I don’t go crazy with design on the back. Usually just two widths of fabric and maybe one row of interesting blocks to make it look intentional. Hand quilting through the seams on the back isn’t a lot of fun. It happens so often that I end up liking the pieced back of a quilt better than the front! The use-it-up and anything-goes mentalities mean that we end up with something totally unique and interesting. So I just started making some duvets for my little girls that will be completely improv-ed on the front and back- they each will have two quilt backs!